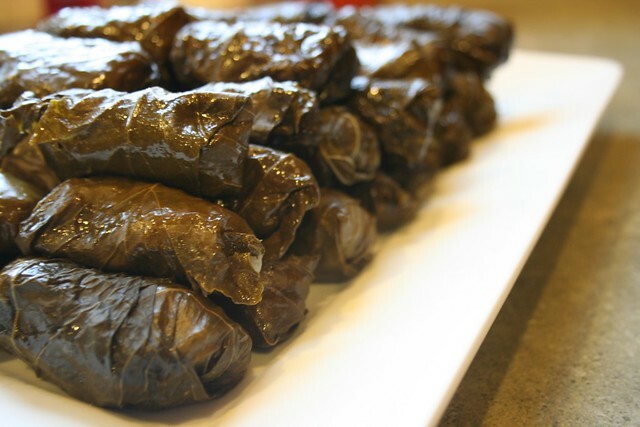 This was my third attempt at making dolmades over the past year or so and I am happy to report success at last. I have always loved these ever since Uncle Tom and Aunt Evie introduced them to us, but could never quite get it right. We were at the West Side Market on Saturday and they were charging $7.00 for a half dozen of them so I said… sam hell… I can make those for much less and much better to boot. Fennel….our new favorite vegetable that makes everything taste good: (made a risotto on Saturday w fennel, shitakes, cremini and sausage… awesome). Not the most beautiful things… and they are a lot of work…but they sure taste good. Recipe 99% from Tyler Florence on FoodNetwork.com after looking at lots of recipes. 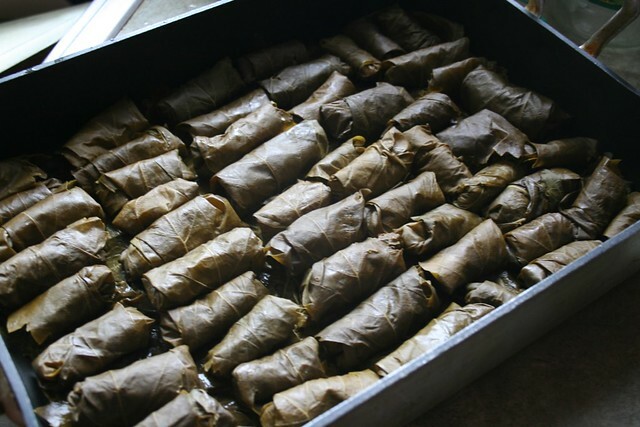 I also learned from watching quite a few YouTube videos of Greek Grandmas dolmades techniques. To make the filling, coat a large saute pan with 1/4 cup of the oil and place over medium heat. 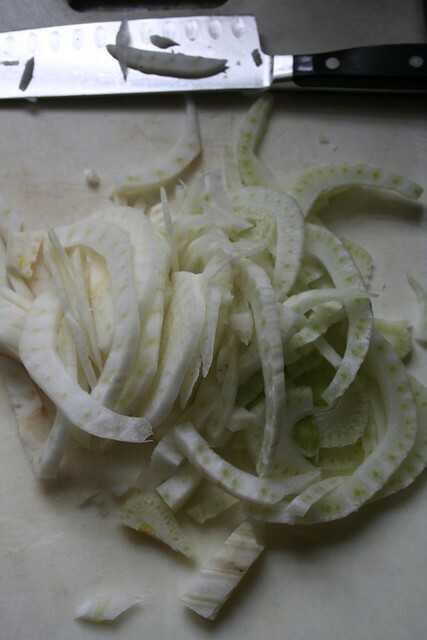 Add the onion, fennel and lemon zest and stir until soft, about 10 minutes. 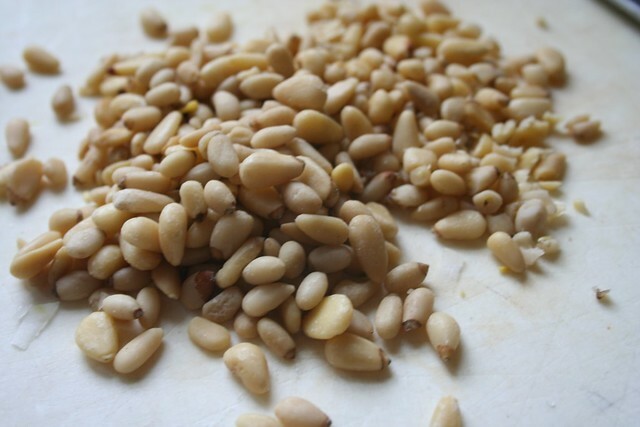 Add the pine nuts and rice, saute for 2 minutes, stirring to coat. Pour in just 1/2 cup of the chicken stock and lower the heat. Simmer until the liquid is absorbed and the rice is al dente, about 10 minutes. 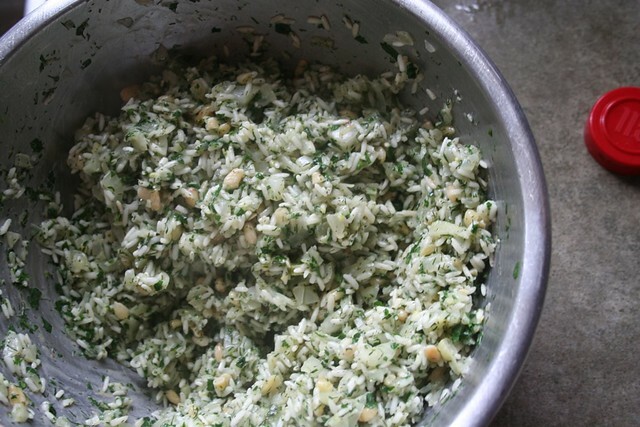 Scrape the parboiled rice mixture into a bowl and add the dill, mint and parsley; season with salt and pepper. Allow to cool. Bring a big pot of water to a simmer. 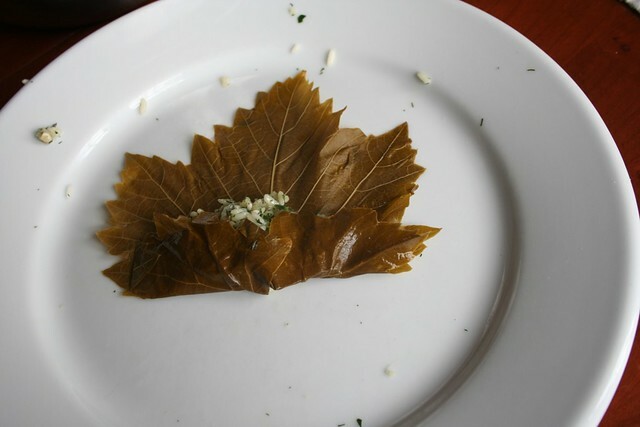 Blanch the grape leaves in the hot water for 5 minutes until pliable. Drain then trim the stems and any hard veins from the leaves. Pat dry with paper towels. The leaves are all really packed tight in the jar. I found it easiest to separate them by submerging them in water. 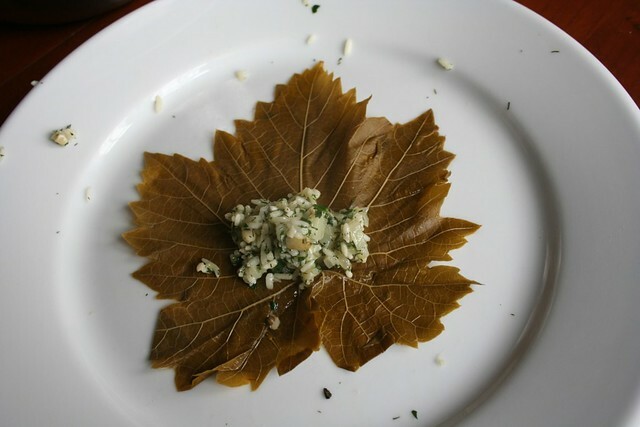 To assemble the dolmades, lay a grape leaf on a work surface, shiny-side down. Put 2 tablespoons of the rice filling near the stem end of the leaf. 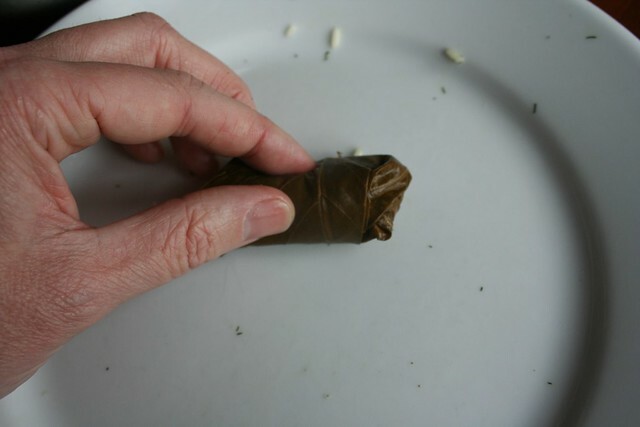 Fold the stem end over the filling, then fold both sides toward the middle, and roll up into a cigar – it should be snug but not overly tight because the rice will swell once it is fully cooked. Squeeze lightly in the palm of your hand to secure the roll. 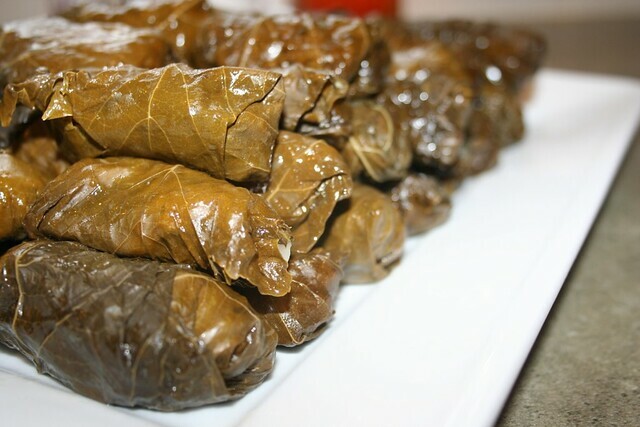 Repeat with remaining grape leaves and filling. We have lots and lots of tomatoes this year. Not lots of big ones, but lots of italian and cherry ones. We made a big batch of bruschetta last weekend. It didn’t last very long. Don’t confuse Jack as the one who made these beauties….just the one who ate most of them :). Not really much of a recipe. Combine HVR mix and oil; add dill week, garlic powder and lemon pepper. Pour over crackers, stir to coat. Place in warm oven for 15-20 minutes. Toast thick slices of bread on cookie sheet until hard. (15 minutes at 350). Rub fresh clove of garlic over toasted bread. Garlic will be imbedded in bread. Drizzle, generously, olive oil over bread. Sprinkle with freshly ground salt and pepper. Additional toppings can include, fresh tomatoes, fresh basil, sun dried tomatoes, olives, fresh mozzarella etc… Pour more olive oil over toppings. Cut the cauliflower, broccoli and mushrooms into bite size pieces. Mix marinade ingredients thoroughly and pour over vegetables and allow to stand overnight. Toss several times. 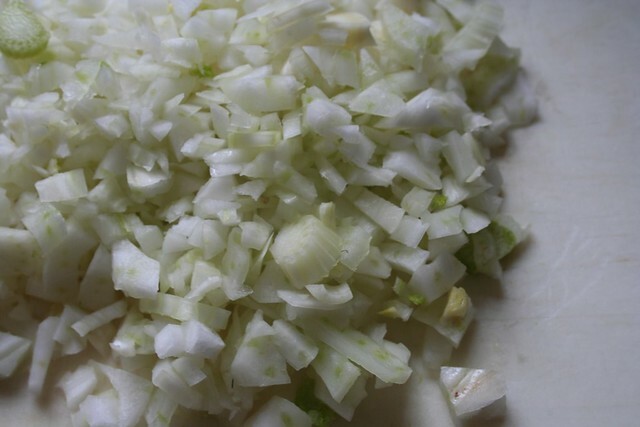 Sauté onion in butter. Mix in the rest of ingredients until the cheese is melted. Dip with plain tortilla chips. Once cheese has been added do not try to reheat as the cheese will separate.